In the early days of online gambling, figuring out whether to download a casino client or utilize the Flash-based instant play option (no download) was an easy choice. If the download version was compatible with your operating system, it was the better option. If not, Flash was the only convenient way to go. Things have changed a lot since then. Now, we have online casinos, mobile casinos, digital and live dealer casinos, and there’s no need to download software to use any of them. But it is an option in many cases. This leaves some players wondering what the difference between the two is, especially for mobile casino players. Are mobile casino apps the best way to go? Is it better to play directly in a mobile browser? Both have their advantages. As for which is the better option, it’s really a matter of preference. We’ll take a look at the differences between the two, and potential pros and cons. Mobile casino apps are available in great abundance. Almost every real money gambling site offers them. So long as you have a compatible device (generally any Android 4+ or iOS 4+) they may be the right choice for you. Pros: One of the top motivations for choosing mobile casino apps is having one-tap access to the games. If you’re the type of player who doesn’t get a lot of time to play, being able to load up a game at a moment’s notice can be beneficial. The promotional aspect can be better, as well. Some casino’s offer special bonuses, like free credits or free spins, to players who download the app. Cons: On the other side of the coin, the game variety within apps can be much more limited. Where you might find 500+ games in a browser-based platform, apps are often limited to 50-100 games. It can also be much more difficult to find real money mobile casino apps, especially if you’re searching in Google Play or the Apple iTunes store, where thousands of play-money casino games exist. It’s much easier to get these apps directly from the website of the online casino that supplies them. 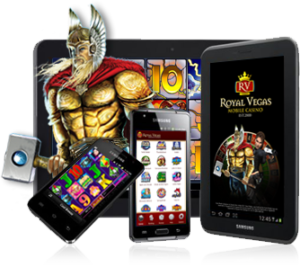 These days, every mobile casino allows its players to access the games directly from a browser. The games are developed in Flash, and are compatible with every major desktop and mobile operating system, thanks to the recent transition to HTML5 Canvas. Pros: Playing an in-browser Flash casino gives players access to a much wider variety of games. Hundreds of slot machines, plus dozens of table games, video poker games, instant win games and skill games are often supplied. Live dealer casino games (if available) are also supplied in the instant play version. They won’t take up any precious space on your internal storage. There are no compatibility issues with in-browser casino games, either. Whether you have an Android, iOS, Windows Phone or Blackberry, you’ll have no trouble playing real money casino games on mobile. Cons: It takes longer to navigate to the website and log in each time you want to play. You’ll have to load each game every time, as well. Without an adequately equipped mobile device, instant play casino games can run noticeably slower than they do on a mobile casino app.